Throughout Comic publishing’s long history of breeding countless companies, you are bound to find just as many imprints. Dark Horse has had past imprints like Legend where well-known creators like Mike Mignola and Frank Miller tried to create a creator-owned name under Dark Horse’s own. 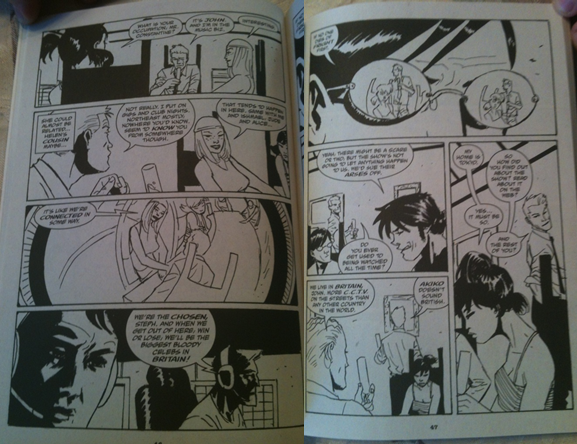 Publishers like Del Rey and D.C. Comics used to have Manga imprints like Del Rey Manga and CMX. Even the all-encompassing Vertigo is but a monstrous imprint of D.C. Comics. I bring this all up because I decided to take a look at one of Vertigo’s own sub-imprints, simply named Vertigo Crime. Vertigo Crime, by my definition a recent line of crime focused comics that were self-identified by similar stylized covers, done by Lee Bermejo. Since is my nature, I choose the one with the skull on the front, otherwise known as 2009’s Dark Entries. Dark Entries is a step-on-a-new-island for Scottish crime novelist Ian Rankin(hard to miss his name, it takes up a quarter of the cover), whose known for the long running stories of the heavy drinking Detective Rebus, which starting with the 1987’s Knots and Crosses. I take it that Ian Rankin was chosen to write for this title based off of his history with U.K. set crime fiction. Italian artist Werther Dell’edera wears the artist’s hat for Dark Entries, having worked previously on The Mission and House of Mystery. Dark Entries, is what would be considered a side-story of Hellblazer’s own chain-smoking John Constantine and his relationship with demons and spirits (Before you stop reading entirely by this notion, do know that I was perfectly fine in the context of the story with the little knowledge I had, which pretty much centered around the Keanu Reeves film and flipping through an issue or two of Hellblazer). We see our lead man walking back to his Anytown, England apartment where he discovers that he has an unwanted guest waiting for him. This home invader being Mr. Matthew Keene, an employee of a local British T.V. channel that focuses on reality T.V. Mr. Keene wants to hire Constantine for one of their latest programs, called Dark Entries, where six contestants are locked up in a large in studio house where their actions are watched and enjoyed by the viewer. The program focuses on introducing fear into a controlled environment; the only problem is that the toll has already started to take effect on the contestants. They are experiencing unique nightmares that have started, way ahead of anything the company had cooked up. Constantine’s job is to investigate and see what could be the cause of the early onset nightmares. Constantine arrives at the station video surveillance room where he is privy to shots of the contestants. His interest hits its peak when he discovers that a contestant by the name of Stephanie looks exactly like his past love. Realizing that he is wasting his time outside of the action, he persuades Mr. Keene to allow him to take part in the show as a contestant to get to the bottom of this. Mr. Keene gladly follows suit and sends Constantine inside to investigate. Once inside the contestants greet Constantine with a mix of sincerity and suspicion. Constantine learns that all of the contestants do not remember signing up for the show or anything before that for that matter. Some hours after a contestant created drinking party, the lights shut off, starting the ball in motion when one of the contestants disappears. They go looking and thus starts Constantine’s detective’s story that let me just say has all of Hell’s demons clamoring for more. As I stated earlier, Ian Rankin has been around the U.K. Crime Fiction scene (that was not intentional) for over two decades before putting out Dark Entries. Now, while most of my crime fiction knowledge comes from being an avid Jeff Lindsay fan, I tend to see the Crime Fiction genre unanimous with the Detective Fiction sub-genre. I interpreted Dark Entries as a detective story with sleuthing to be had, where in a Crime story the plot might have a recent murder act as the catalyst, as in say Scars. 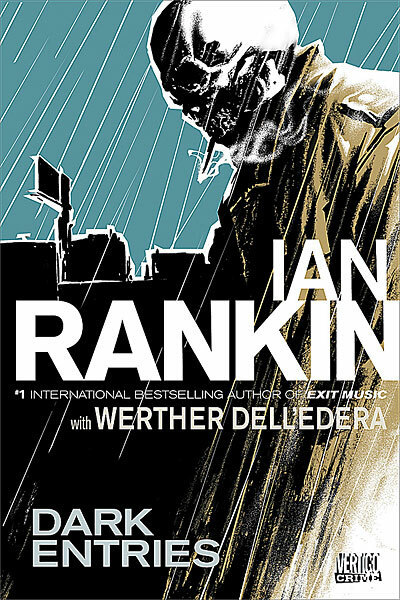 Ian Rankin’s story ran with Constantine being more of detective than anything else, but not in the beat-cop/ badge showing way I had in mind. I do play devil’s advocate by stating that this was impossible with the closed-door environment that he created. I have mixed feelings on Werther Dell’edera’s artwork and its use of extreme shadow. Now while there is shading here and there, his art style is focused more on characters and objects being white figures contrasted with pure pitch blackness. It almost looks like every other thing is sitting in a black panel with a light shooting down at them from a random angle. I liked how he would bother to draw the character’s age lines to illustrate general age difference, with Constantine looking as rugged and gruff as needed. 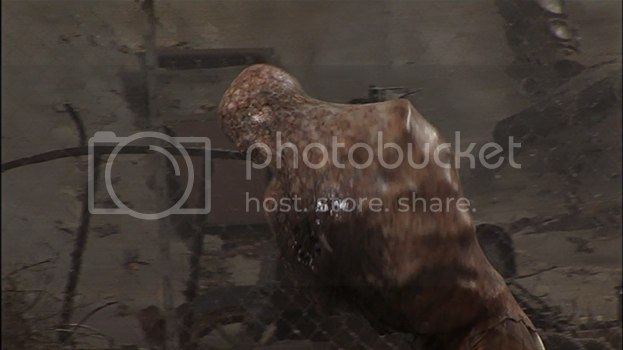 In an attempt to not spoil too much of the plot, I did really enjoy his demon designs that reminded me of the Armless Man/Trojan Man from Silent Hill. I also liked how he changed the panel frame from white to black after a certain point in the story. Pros: Constantine as a character does not require twenty plus years of Hellblazer knowledge to bog down first time readers. The story is self-contained enough that it works as a quick loan to anyone who dreads multi-volume magnum opus. Werther Dell’edera’s artwork. Cons: Reading this far, you might have realized that I did not bother to name the other contestants. As the plot moves along, I started to understand that they were more extensions of the Stephanie character, even though they were flushed out to a degree. Certain supernatural plot points that poked holes in the narrative. A justified nitpick; most of the characters address the contestant as teenagers, but they look and act like people in their early to mid-twenties. This just drew on my nerves because they try to dig this in too deep. Werther Dell’edera’s artwork. Well that was Dark Entries. Bottom line, it did not blow me away by any stretch of the imagination, making a picture perfect example of an “It was fine”. But it was enjoyable enough that I will be trying to loan it out to non-comic readers in the future. And in my book that counts as something because there is no need to let Dark Entries swim only through the streams of the super-informed comic reader.